A few of my colleagues and I are organizing the New England Workshop for SDR (NEWSDR) next month and we are currently accepting submissions for poster presentations. 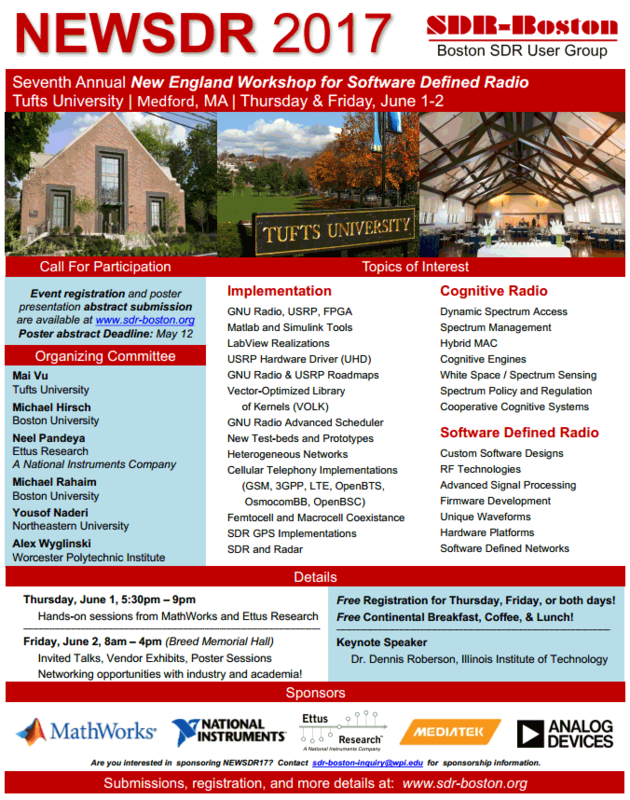 The event will be held at Tufts University and is sponsored by MathWorks, Ettus/NI, MediaTek and Analog Devices. It is the 7th time we’ve held the workshop and we typically have attendance of 80-100 people from industry, academia, and government. This seems to be mostly an academic and industry conference type event, but a few people reading this blog may be interested. Registration is free. MediaTek? Really… MediaTek? The same GPL Violator and spreader of closed broken code/drivers MediaTek from China? If yes – I’ll pass.